The sugar snap peas in our garden are growing like weeds, which is saying something because the weeds are a little bit out of control over here. I was feeling so excited and proud of myself for deciding to plant an entire bed of that candy-like vegetable. They're not good! I mean, they're edible. But the shell is tough, almost like they're shelling peas instead of sugar snaps. But I checked the package of seeds, and they are most definitely Sugar Daddy Snap Peas, meant to be eaten whole. We're getting peas from our farm share right now as well, and the difference is extreme. When I bite into a farm share sugar snap, it's crisp and juicy. When I bite into one of ours? Well, first off, they feel hard and almost hollow, and then when I take a bite, it's like that first time I ate edamame - when I thought you ate the whole thing and had to suffer through chewing that fibrous shell. Oh, and they're definitely ready to be picked - it's not an issue of picking too soon. The only thing I can imagine is that the Burpee seeds (from their organic line) we got this year (as opposed to the High Mowing seeds last year) were just not very good. 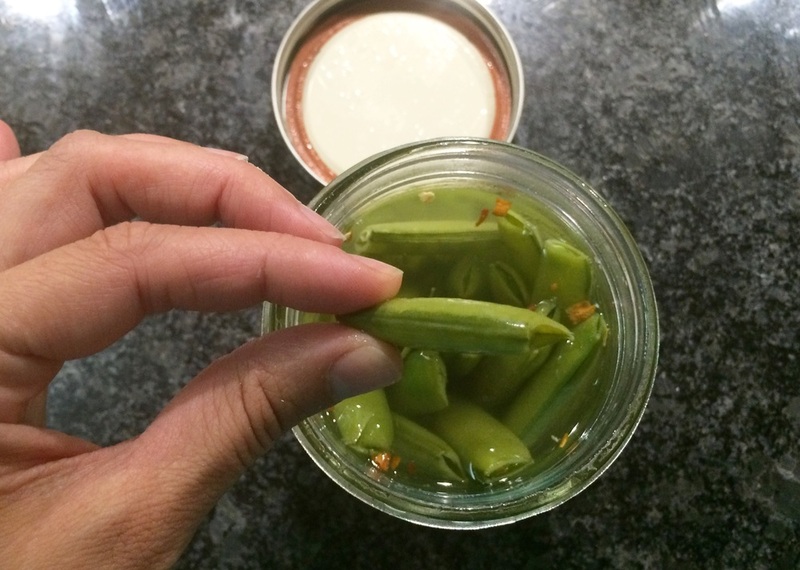 I was - still am - feeling super disappointed about it, but I had come across Natalie Freeman's recipe for refrigerator pickled sugar snap peas some time before and been intrigued. I thought I'd try it out and see if it made the peas more edible. So this weekend, I picked a whole heap of them, made the brine from salt, vinegar, and honey, poured it over the trimmed peas and a little garlic and red pepper flakes, and put them in the refrigerator to do their thing. They're delicious! I want to pickle everything! Refrigerator pickling is so fast and easy, and I'm going to have a lifelong devotion to Natalie for showing me that I can use honey in place of refined sugar with great results. It didn't 100% fix the peas - there is still a little toughness in them. But they'll continue to soften in the brine, and this way they're at least easier to chew! And they have a great flavor. I'll definitely be making more batches as I pick the rest, and I'm going to start thinking about what else I can pickle. Check out Natalie's recipe, and let me know if you try it! p.s. Try this simple tomato and hearts of palm salad this week.